"Four score and seven years ago..." starts one of the most famous speeches in American History and Ms. Bauman's kindergartners know every line by heart. Dressed as little Lincoln's, the class presented the Gettysburg Address at the Fairmont Expo last month and were invited by Mayor Tom Tait to perform it at last week's city council meeting. Parents, teachers, fellow Citron students and press from the OC Register were in attendance at Friday's on-campus presentation. You don't want to miss the Register's coverage including a photo gallery and video posted online. 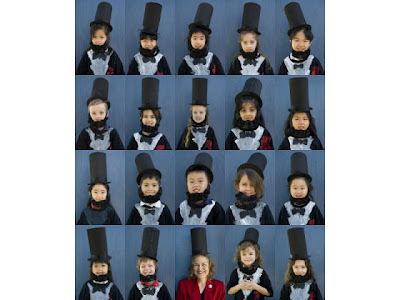 We couldn't be prouder of our pint-sized presidents or of their teacher who has passed down her own love of country to successive generations of future leaders.